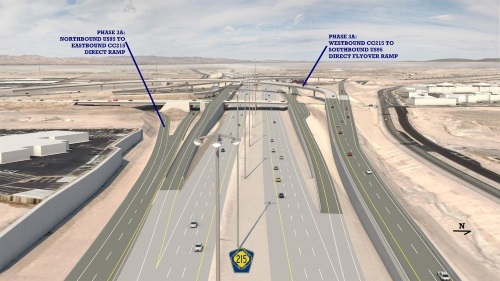 The Nevada Department of Transportation kicked off the “next phase” of its “Centennial Bowl” interchange project on Jan. 22; a project aimed at revamping the connection between U.S. Highway 95 and 215 Beltway in northwest Las Vegas. This construction portion of this project is valued at $61.5 million, the agency added. He noted that the Centennial Bowl project aims to remove part of the Oso Blanca Road ramp and the old north-to-west loop, thereby making room for three new freeway flyover ramp connections, including: eastbound 215 Beltway to U.S. Highway 95 southbound; southbound U.S. Highway 95 to eastbound 215 Beltway; and northbound U.S. Highway 95 to 215 Beltway westbound. The agency noted that flyover ramps enable direct freeway-to-freeway connections while still maintaining highway travel speeds for greater efficiency and safety. Also, the structures require little right-of-way and eliminate the current stop-and-go surface street travel currently needed when navigating the interchange, Nevada DOT pointed out. Nevada DOT said this portion of the Centennial Bowl project entails building the state’s second longest bridge – a 75-foot-tall by 39-foot-wide concrete box girder structure that will measure 2,635 feet or the equivalent of seven football fields. The two-lane flyover bridge will connect north-to-west freeway traffic, with plans also call for constructing a south-to-east flyover as well.